The punch that turned out the lights on Paul Williams. With news that Ken Hershman was scooped up by HBO (and away from Showtime) to be the new president of HBO Sports, it makes me feel hopeful that the debacle at HBO Sports and their problems with reaching their budget and forcing some non-PPV worthy fights onto PPV is over. This hopefulness has me thinking of some fights that I would love to see. Not that any of these fights will or will not be made, just my current wish list. I want to see two men* in the trenches, pouring their heart and soul into every punch. Refusing to give into the will of their opponent and fight as if it was their last chance in the ring. I realize Cotto has a fight on HBO PPV coming up (I see a Cotto KO victory over Margarito, btw), but I don’t care. The styles that both men have would end in nothing less than fireworks. I understand and appreciate a fighter that is over skilled defensively and from time to time it’s a joy to watch someone so skilled in that craft do their work in the ring, but what I really enjoy in a fight above all else is a fight. I think these two have the potential to have a 5-star fight. I have almost no doubt Maravilla would win, but I am also sure that Cotto would give him everything he could handle. 4. Yuriorkis Gamboa vs. Gary Russell, Jr.
Russell, Jr. is realistically about three fights away from being ready for someone of Gamboa’s quality. It’s just that to see Russell in the ring now you would think he’s a 10+ year veteran. He looks extremely polished with the whole package at his disposal. The 23-year-old has speed, power, defense and controls the ring like a grizzled veteran. 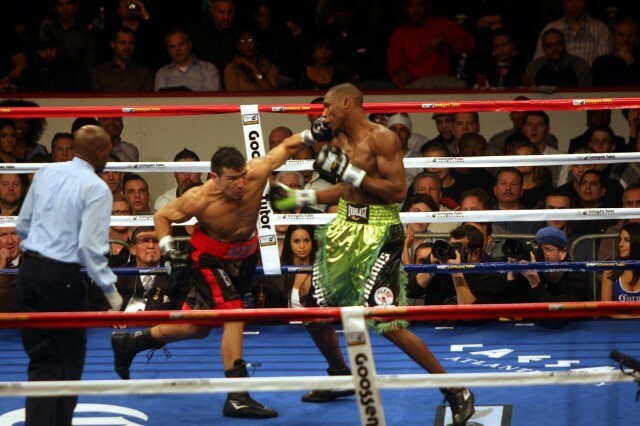 Gamboa is no slouch though. While I am high on Russell, I think Gamboa is the cream of the featherweight division. He, too, has almost unmatched speed and throws deadly accurate combinations. His major flaw is his ability to disappear for a minute or so in some rounds. He can get away with that against most because he is so superior in talent and quickness, but another grade A fighter would be quick to exploit that weakness. Brandon Rios laying waste to Urbano Antillon. Love the talent of both fighters. Rios is just mind blowing to watch. He’s basically a larger Gary Russell, Jr. with the exception of being able to throw more consistently vicious combinations. Khan is a great fighter in nearly every way, but two. He is 1) very susceptible to power punches (i.e. the end of the Maidana fight & against Prescott) and 2) prone to lapses in production, effectively giving any opponent he is fighting a change to beat his face in. Luckily for Khan he has been fighting people who cannot take advantage of these lapses (Malignaggi, McCloskey, Judah). When he is on his game I do love his masterful ring generalship and biting jab that is almost like a straight. It’s apparent that I love speed, power, and combinations. Gamboa I have already spoken on. Donaire is a beast. If not for a split decision loss in only his 2nd career fight he would be a cool 27-0. He is his own personal thunder storm (moves like lighting and punches like thunder). The fight would be pure speed and most likely a fight filled with explosive exchanges. A match up like this brings a smile to my face because he has the chance to get ugly (in a good way) real quick. Do I really have to explain this one?! Bonus: Sergio Williams vs. Floyd Mayweather, Jr. This fight has about as good a chance as Floyd’s possible fight with Pacquiao of getting made, but wouldn’t it something if it happened? Martinez is no Carlos Baldomir. « AJ Burnett, God help us!